Hamza ciliaris (Linnaeus, 1758) is found in south-east Asia, specifically Indonesia. 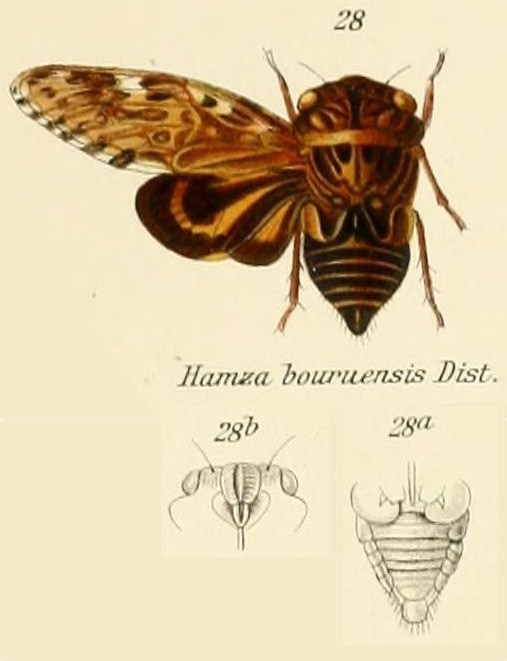 Hamza ciliaris has many synonyms / former names, and Hamza bouruensis, as seen in the image below, is one of them. Characters. — Body short, broad; head including eyes about as wide’ as the anterior margin of the mesonotum; ocelli placed nearer to each other than to eyes; pronotum with the lateral margins ampliated, obtusely angulated near middle; anterior femora distinctly tuberculately spined; metasternum slightly elevated, broadly centrally sulcate and sinuately truncated; tympana only about half covered by the dilated and expanded lateral areas of the basal abdominal segment; opercula short, broad, their apices convexly rounded; tegmina about three times as long as broad, the basal cell broad, with at least four angles, ulnar veins widely separated at their bases.